Zoe has disappeared, years earlier than I thought she would, behind a screen. Playing video games. If it's not the iPad, it's her Kindle Fire, and if both are being charged, she either plants herself near the outlet so she can keep playing or asks to borrow my phone, repository of her first game. It started innocently. We had a long wait one day so I downloaded a face-painting app to my phone for her to play. It was a simple game. Swipe paint on a little cartoon face then swipe it off, accompanied by such mellow music it made Bob Ross from The Joy of Painting seem like Dennis Hopper from Apocalypse Now. But soon enough she graduated to more complicated games, games of dueling dragons and building houses and dressing up cute fluffy animals. Occasionally she'll ask me how to do something in one of these games but I can't figure it out either. Games were so much less complicated in the eighties, that golden era of my youth. Pac-Man did not have to hire anyone to grow his power pellets and floating fruit. Frogger just wanted to get across the street without getting squashed. Simpler times. 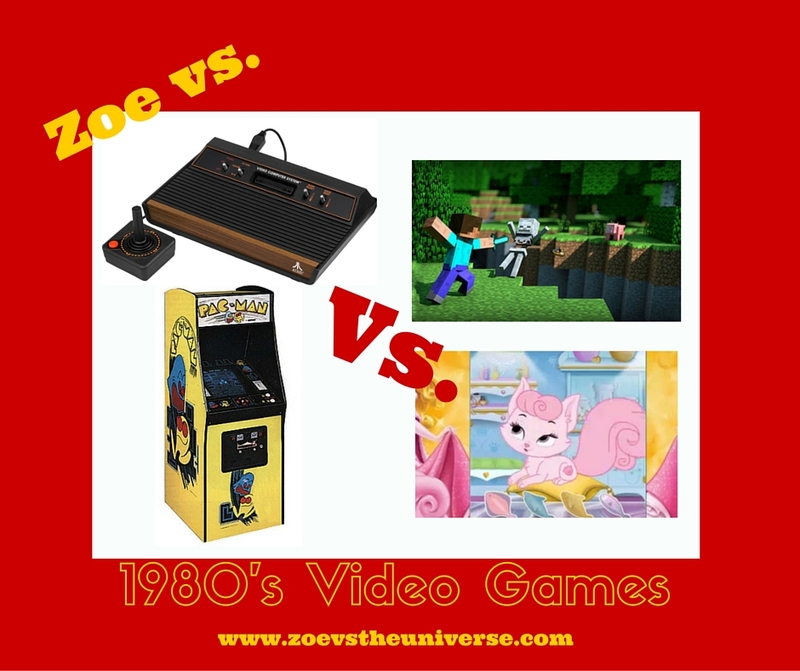 So let's compare the video games of the eighties to what the kids are playing today. Though I never thought of myself as much of a girly-girl, it's true that I gravitated toward the "cuter" games, like Tapper and Dig Dug, Pac-Man and Popeye. But today's cute is at a whole new level. Big-eyed kittens and puppies. Wearing bows and tiaras. And lots of pink. It's a frolicking, cooing, toothache-inducing nightmare. As Voltaire said, Cute is the enemy of good digestion. Zoe has several of these aggressively adorable games. For instance, Palace Pets. The Palace Pets are the animal companions of the Disney princesses, and they live in Whisker Haven, an utterly nauseating place, where you can pamper Cinderella's puppy, Pumpkin, or Snow White's pony, Sweetie, with petting, baths, and playing dress up. Within limits. Some accessories are only available for an added fee. Because as certain as death and taxes is downloading a game app for free but then being assaulted by pop-up ads or roadblocks requiring an additional 99 cents to unlock Whisker Haven's spa center or acquire a new ribbon for Coco Pony's tail. Dig Dug never even got a pimped-out air pump. Games haven't just increased in the degree of cuteness but also may be even more addicting. As Taco Ockerse said, Brain suction is the enemy of bath time. It's a fight every night to get her to put the iPad down. Just one more marketplace to set up, one more library to build. I tell her if she can't put the game down when I ask, she can't play with it ever again. Threats are the only things that work. I worry that playing all day is stunting her interpersonal skills. Though she does talk to her games. For instance, I'll hear, "No one can find me in my secret tunnel." "Give me your gold, my dear monster." "All the worlds are mine." There are online games she can play with other people but we're not letting her do that. Even so, online play is a far cry from playing Pong on Atari while sipping Frescas in your best friend's basement rec room. But did we learn anything from Pong? I don't know. I suppose it taught hand-eye coordination. It almost certainly taught us meditation techniques. And how to bear up under ennui. Zoe's games of building sustainable worlds are certainly interesting. First, there's all the crop growing. So I suppose Zoe's learning patience as she must wait several game cycles for her plants to grow so her cow can eat and so produce milk for her farmers so they can clear more land for farming. Delayed gratification was certainly not a feature of Space Invaders or Galaga. A lot of her games require planning and strategy. One day, as I watched her play her Minecraft game, Zoe placed a fire too close to her apothecary, and as it started to burn down, she whimsically added more fires. Soon the conflagration was out of control and the apothecary was no more. I hope she learned something about the danger of fire from that---or perhaps how to work an insurance scam?---but, in any case, she rebuilt and moved on, and there's a lesson there. 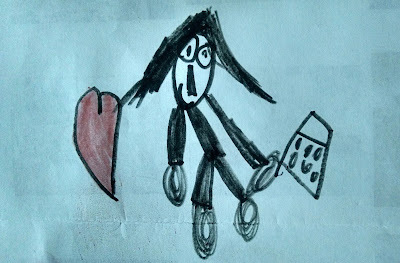 Speaking of brain suction, this is a picture of me Zoe drew. In my left hand is my phone. It also looks like a cheese grater. All the fighting and violence are also more realistic now than what we had in the eighties. One of my favorites was Popeye, and, as Jeff Spicoli said, Popeye is the enemy of Brutus. The object of the game was that Popeye had to catch the hearts Olive Oyl threw and then eat some spinach and knock out Brutus before Brutus could do the same to him. And let's not forget Punch-Out!! This game was in every arcade in the eighties. Your boxer against the game's. Your ears ringing with the announcer's "Body Blow" and "Uppercut" till you hopefully KO'd Glass Joe. In contrast, today my five-year-old's breeding hybrids of dragons and mutant gorillas for her monster fight club. She's got to feed them (more farms! ), create habitats, a hatching and breeding center, and maintain a whole ecosystem. I'd like to think today's games are at least teaching Zoe the value of money, what with the "gold" in the games and the fact that she's often blocked from reaching the next level for want of Mommy's credit card number, but I don't think so. She often insists pop-ups---covered in dollar signs, by the way---are offering freebies. It's not exactly subtle. Every day I check my email with trepidation, expecting to see subject headers that say "Thank you for your order." I do get those emails, and usually they indicate new characters she unlocked "for free" through actual game play. "Treasure has joined her friends in Whisker Haven" (which sounds ominous, as if Treasure's shucked off her adorable mortal coil). But in the larger two-player game of Mommy vs. Zoe, I know Zoe will eventually wear me down, and when one day I see she's purchased fifty bucks worth of gems for Dragon Island, I expect I'll have no reaction except to wonder if it's for the new hatchery, because I've heard the fire dragons Coatlicue and Peanut are expecting. Full disclosure: As kids, when my sister and I went to the arcade we assumed an endless supply of quarters in Dad's pockets, and if by chance he ran out, we'd steer him toward that magical machine by the entrance, and explain: If you put twenties in this, it will give us quarters. At which point he'd hand us one final dollar, probably the most wrinkled one he had, and go looking for a bar. That's when we learned a valuable lesson in perseverance, as we rubbed that dollar over and over on our jeans to smooth it out and kept feeding it into the slot until we finally hit pay dirt. When I was about ten years old, I also started getting an allowance from doing chores in order to buy games and music. Presently Zoe "earns" upgrades through game play. Which is good and bad. After all, my dishes don't wash themselves. Then again, I don't really mind washing dishes. It's meditative. Just like Pong. Want to continue playing? Click here to subscribe.